Food and Wine is a monthly magazine for those with an appetite for adventure in cooking, dining, travel and who believe a good meal and a fine glass of wine with good company is a little slice of heaven. Each issue typically focuses on a particular theme – simple healthy dishes; healthiest test kitchen recipes; best new chef annual and secrets of the hottest tv chefs are but a few stand-outs – offering up recipes and menu ideas to easily recreate at home. 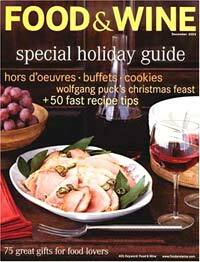 Standard within each issue are restaurant reviews, editor’s picks for great kitchen ideas to buy, and of course articles on wine and spirits. Of course the photography is stunning and the design super-stylish but, what really sets Food and Wine apart for us is the calibre of the writing and guest editors. What wine lover could resist a peak at Robert Parker’s 20 favorite wines. And, with food greats like Jacques Pepin (menu for perfect beach party), Steve Raichlen (tastiest ribs) and Mario Batali (best grill recipes) dropping in to offer some tasty ideas we are in fine company.